The Jacksonville Jaguars have moved to fill the hole left by Leonard Fournette's continued absence by acquiring running back Carlos Hyde from the Cleveland Browns. The Jags confirmed they are sending a fifth-round pick to the Browns in the deal. While the move shores up the Jaguars' backfield with Fournette continuing to recover from a hamstring injury, it also frees up rookie Nick Chubb for more carries in Cleveland. 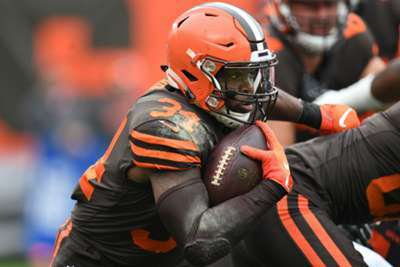 The second-round pick has just 16 carries through six games and Browns fans have been vocal about wanting to see more from the 22-year-old — particularly since he exploded for two long touchdown runs against the Oakland Raiders in Week 4. We have traded a 2019 5th round pick for @elguapo.